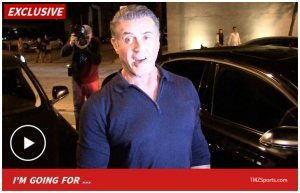 TMZ SPORTS -- Sylvester Stallone isn't just a huge fight fan, he's also a minority owner of the UFC -- and tells TMZ Sports he's genuinely concerned for Conor McGregor after his latest arrest. "This is a crossroad in his life," Stallone told us in Beverly Hills ... referring to both the arrest AND the fact he's coming off a huge loss to Khabib Nurmagomedov. "If he can't overcome his fear and beat this man, I think it'll plague him for the rest of his life." The conversation with Stallone is amazing ... he opens up about all of the issues Conor is facing in his life and provides him with a road map on how to come out on top. In fact, Stallone says McGregor should be "inspired" by the obstacles in his life -- and use all of the negativity to fuel an epic comeback ... both in and out of the Octagon. Sly says Conor should tell himself, "Okay, I've gone through a very rough time. I've been somewhat publicly humiliated. I'm at a crossroad in my life ... I have to overcome an incredible opponent who seems invulnerable." That's when Stallone honed in on Conor's loss to Khabib -- "This is a crossroad in his life. This is probably the most important one because if he doesn't live up to his ideal ... if he can't overcome his fear and beat this man, I think it'll plague him for the rest of his life." "I think [Conor] lost last time because he got resentful, he got prideful, he got arrogant ... put his hands down ... he walked right up to that gentleman and he just got smashed in the face when he could have been defensive. There was no Plan B. Not even a Plan A minus." Stallone says he REALLY wants to see a rematch between the "two UFC Gods" -- adding, "I wanna see a guy that leaves everything on the table." As for Conor's pending legal situation in Miami, where he's accused of smashing and stealing a cell phone from a fan who wanted a picture ... Sly has some advice for Conor on handling the burdens of fame. "Keep smiling. You can't critique a smile."